Don't you get it!? You see the hat!? I am MRS NESBITT!!! Toy Story is a film about a group of toys owned by Andy Davis. Acting lifeless in the presence of humans but coming to life when they are alone. We follow their wacky adventures and learn the true meaning of friendship through besties Buzz Lightyear and Woody. Once Buzz realises he is not an intergalactic space man and simply one of Andy's toys he goes in to somewhat of a crisis. Being taken in by the evil Sid's younger sister Hannah he adorns a Hat and apron and takes on the persona of 'Mrs Nesbitt'. Look... at least the hat looks good. 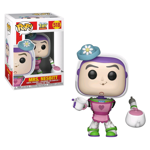 Add Buzz or... Mrs Nesbitt to your Pop! vinyl collection today!